The incident with Minami Shunichi‘s grandmother almost setting the house on fire and talking about seeing the One Inch Princess has the mothers of Minami Shunichi and Horikiri Chiyomi concerned about her staying in the house alone. Horikiri Ritsuko offers to come over to watch over Minami Shunichi‘s grandmother whilst the family is out during the day. Horikiri Chiyomi is also worried about Minami Shunichi‘s grandmother. 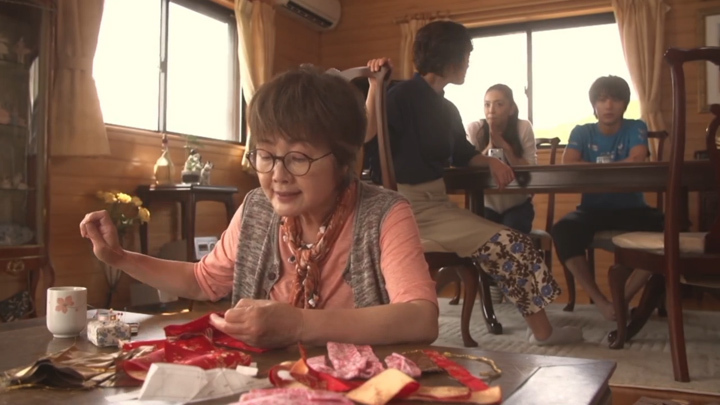 She talks to Minami Shunichi about letting her stay at home to watch over his grandmother. Minami Shunichi is initially against her doing, worried that now his grandmother saw her, she’d be looking for her; but after she convinces him that his grandmother would be looking for the One Inch Princess and not her, he gives in. Minami Shunichi was right about her grandmother did go looking for her, but as Horikiri Chiyomi told him, she was looking for her as the One Inch Princess and not Horikiri Chiyomi. Their second encounter has Horikiri Chiyomi try on a beautiful kimono Minami Tomiko hand-sews for her. "Did you make this for me, Grandma?" Horikiri Chiyomi asks. Minami Tomiko asnwers "Well, you know, One Inch Princess should be dressed like that right?" Their conversation is interrupted when Horikiri Chiyomi‘s mother, Horikiri Ritsuko, drops by as she had promised Minami Shunichi‘s mother. Horikiri Chiyomi keeps hidden from her mother’s sight behind a table leg of the table where her mother and Minami Shunichi‘s grandmother sits. There she listens to the insecurities her mother has about her marriage to her father. She and her father have been fighting a lot after Horikiri Chiyomi left she tells Minami Shunichi‘s grandmother. Her mother question whether her father loved her all that much from the beginning. He used to love someone else a lot before they got together and they only married because she was pregnant with Horikiri Chiyomi. All of this is not news to Horikiri Chiyomi, but the fact that her father never ever proposed to her mother surprises her. Sitting in class, Takagi Riku happily shares the news with his friend, Mikimoto Ami, that he’s received an email Horikiri Chiyomi telling him that she is doing well at the Solo Workshop: it’s hard work, but fun. This has Mikimoto Ami finally reveal to him that Horikiri Chiyomi isn’t attending the workshop at all. After learning the information, Takagi Riku is at the library in search of the book about the One Inch Princess. He’s curious about the inspiration behind Horikiri Chiyomi‘s latest work, "Chobiko in a Pocket", which seems to be based on the One Inch Princess legend. His teacher, Ohno-sensei, is also at the library searching for the same book. She’s been following Horikiri Chiyomi‘s updates and is curious to why she suddenly started a new piece when her previous work was just starting to get interesting. Standing together on a balcony outside the library, Takagi Riku offers that perhaps she’s going through a change of mind. Remembering how Horikiri Chiyomi liked writing stories based on what she feels and experiences, Ohno-sensei jokingly suggests that perhaps she’s become Chobiko (Chobiko means small girl). Takagi Riku provides an interpretation: perhaps she’s in an impossible love and the ‘Big Guy‘ represents the degree of alienation she feels from not being able to be with him. Takagi Riku wonders who the Big Guy is. He gaze lands on Minami Shunichi who happened to cross his view. 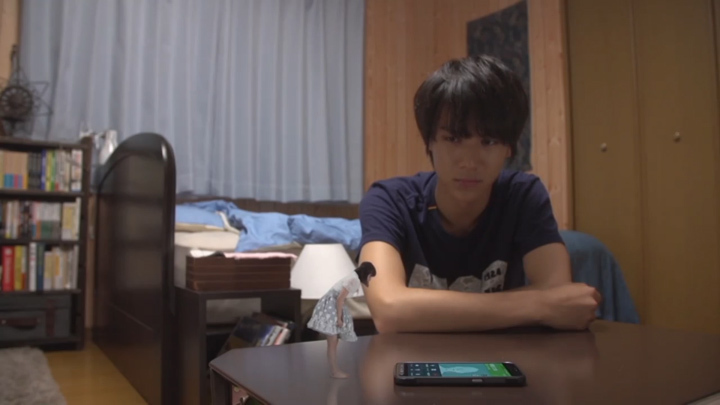 Minami Shunichi is staring intently at his phone. (Minami Shunichi is texting Horikiri Chiyomi about Takagi Riku and Mikimoto Ami finding out about her not being at the workshop.) Takagi Riku appears to connect Minami Shunichi with the Big Guy in the story, but then his thoughts veers off towards simply thinking perhaps he’s been reading Horikiri Chiyomi‘s story and was inspired so much by it as to make a figurine of her like he did. Takagi Riku and Mikimoto Ami visit Horikiri Chiyomi‘s parents with the intention of letting Horikiri Chiyomi‘s parents know that their daughter isn’t at the Solo Workshop. However, they—rather, Takagi Riku—gets side-tracked by the compliments Horikiri Chiyomi‘s father pays Minami Shunichi for his studious ways during Minami Shunichi‘s unexpected visit. (Minami Shunichi‘s come looking for Horikiri Chiyomi, after his text to Horikiri Chiyomi goes unanswered.) In Takagi Riku‘s efforts to defend Horikiri Chiyomi with listing her passion in writing and dancing, he and Mikimoto Ami lose the right opportunity to bring the matter up of not attending the Solo Workshop. Bringing it up after that point would oppose everything Takagi Riku just said about his daughter. 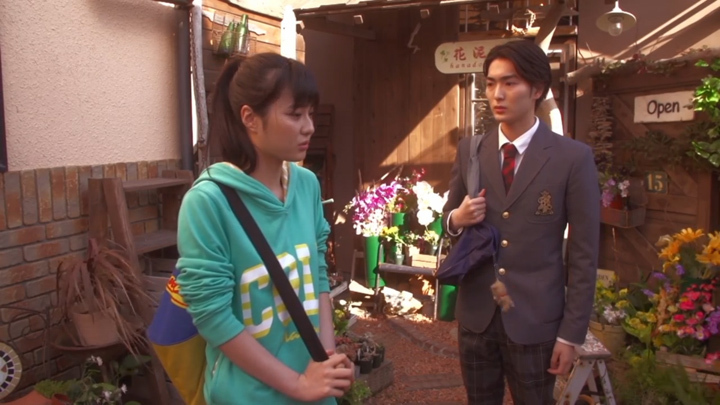 Takagi Riku and Mikimoto Ami leave Horikiri Chiyomi‘s place, standing a little beyond the door, disappointed that they couldn’t tell them about Horikiri Chiyomi not attending the workshop. Unknown to them as they talked, Horikiri Chiyomi‘s mother was in the gardens a short distance from them and heard everything. After discovering the email address on Minami Shunichi‘s tablet to be the same as the one Horikiri Chiyomi uses, Horikiri Asuka looks to find out where exactly her sister is from Minami Shunichi. She catches him arriving home from looking for Horikiri Chiyomi just slightly before she visits. She quietly asks Minami Shunichi to talk in private before dragging him upstairs to his room, leaving no time for him to bring Horikiri Chiyomi along with him. Horikiri Asuka goes straight to the point about him knowing where her sister is. She talks about having seen her sister’s email address on his tablet and how there’s no possible way she can’t have been using his tablet to send her emails. She pleads for him to tell her where she is because her home is in a mess because of her sister. Unable to provide any kind of response, Minami Shunichi only says her name apologetically before telling her that her sister has her reasons, only that she can’t say anything about it just now. He tells her that her sister is suffering, too, and is struggling to find a way to happily come home. He then asks Horikiri Asuka if she could wait a little longer. Minami Shunichi‘s familiarity with her Horikiri Chiyomi‘s situation has Horikiri Asuka question him whether he and her sister is in a relationship together. Like all the other times he’s been asked a question relating to him and Horikiri Chiyomi, he neither confirms nor denies. When Horikiri Asuka presses on, asking that since he and Horikiri Chiyomi are talking about things that they can’t tell her parents or family, isn’t that what it means? He thinks over it for few moments before he says, "Chiyomi needs me to protect her. Right now Chiyomi needs me." He then apologises for not saying anything until now. A few moments of silence take place, both standing in front of each other, unable to look each other in the eye. Minami Shunichi is apologetic, while Horikiri Asuka seems to take Minami Shunichi‘s words as having chosen Horikiri Chiyomi. "I… liked you…" Horikiri Asuka says quietly underneath her breath. When Minami Shunichi seems to have missed her confession, Horikiri Asuka‘s gaze lifts to look Minami Shunichi in the eyes and repeats it. This time, she shouts it to him. "I liked you, too." Minami Shunichi stands there stunned, unable to provide any quite of response. Horikiri Asuka tell him to forget what she said. She apologises to him before telling him she believes him then takes her leave, passing by her sister who’s on the second-last step to the top, looking all dishevelled in her kimono. Hearing her mum talk about the insecurities she has about her father’s love for her, Horikiri Chiyomi calls home to express her appreciation for all that her father has done for her and her mum. 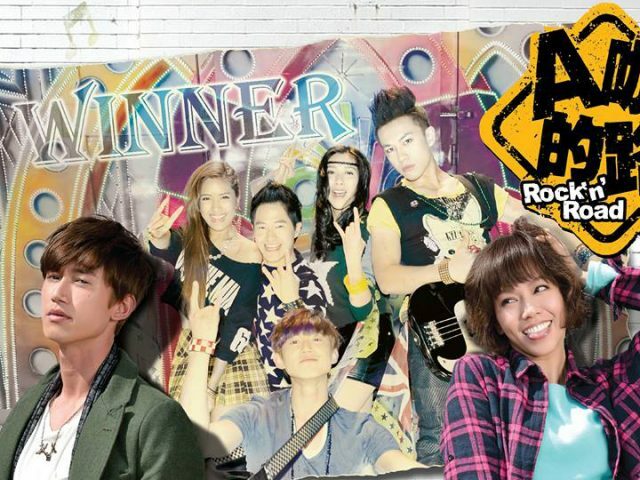 She tells him that she knows that he quit playing heavy metal music and worked really hard for the family. She is really, really grateful for it all. She then relays her mum’s insecurities, telling him about her mum’s insecurities about the marriage: her mum wants to believe that he didn’t marry her because she was pregnant with her, that they married because they were attracted to each other. Her mother is more girly than he thinks Horikiri Chiyomi tells her father, and asks for him to please put his feelings in words because it’s so important for a girl. Horikiri Chiyomi moves to hang up, but is stopped by her father. He tells her that she misunderstood. He tells her that he didn’t marry her mum because he had her. He married her because he loved her a lot and still loves her. In fact, he’s fallen for her. As her dad is saying all of this, her mum hears every word. His attention is drawn towards her by his employees, causing Horikiri Chiyomi to wonder what was the matter was. 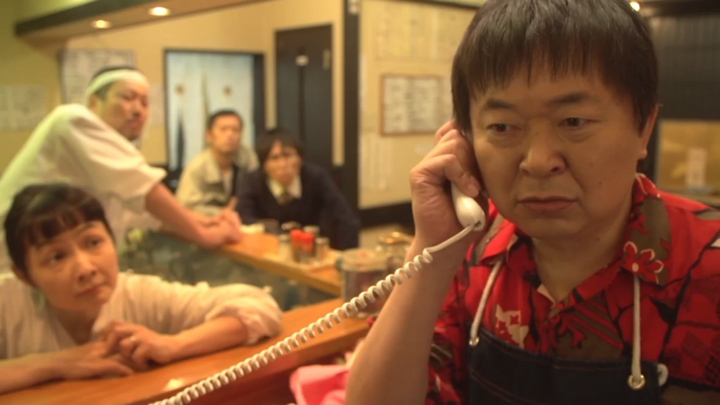 Her dad has Horikiri Chiyomi wait on the phone as he does what he’s forgotten to do from the beginning. 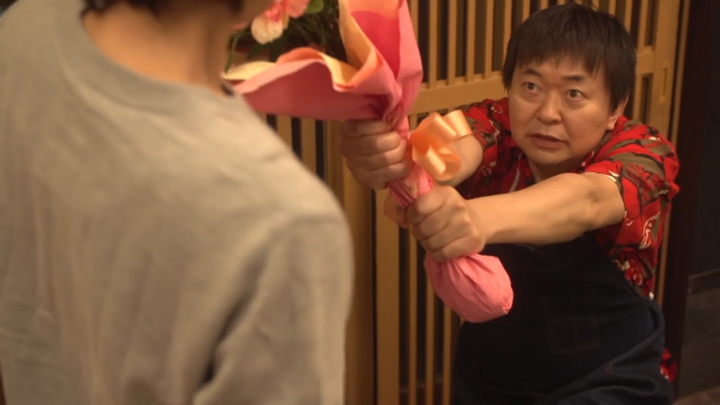 Horikiri Jouji grabs a bunch of alstroemerias and presents them to Horikiri Ritsuko. Through the flowers, he expresses his wishes for them: hope for the future and self-sacrificing love. This is what the flowers symbolises. He then apologises to her for not expressing it earlier and thanks her for being with someone like him these last 18 years. He then finally proposes to her: "Will you marry me?" he asks. Finding the words not exactly right he changes them and ask if she could stay by his side forever. Horikiri Ritsuko accepts his proposal before taking the phone to talk to her daughter. Horikiri Chiyomi congratulates her, happy for mother. Before she is stuck answering more questions which she can’t provide answers for, Horikiri Chiyomi hangs up straight after. 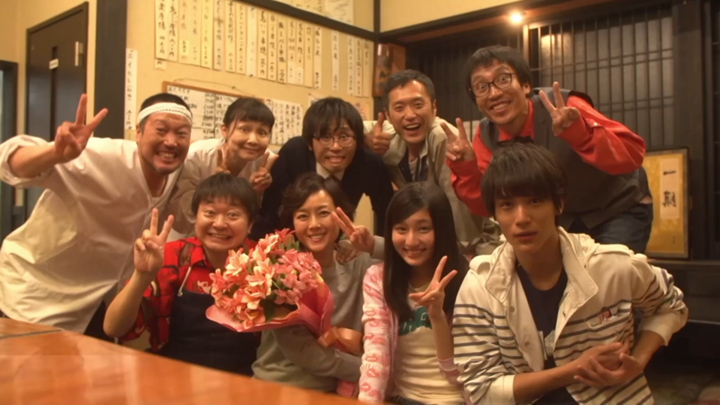 To mark the occasion of the proposal, Horikiri Jouji and Horikiri Ritsuko decide to take a group photo. Horikiri Asuka invites Minami Shunichi over to take part in the photo as well. Horikiri Chiyomi is in his pocket, too. With the photo being such an important one, it seems wrong for her to be left out whilst he is in it. So, without giving much time for Horikiri Chiyomi to think over the repercussions, Minami Shunichi has Horikiri Chiyomi out of his pocket, propped up his hand, and in the photo. Horikiri Chiyomi makes a peace sign and smiles right as the camera takes a photo. Back at home, Horikiri Chiyomi worries about being exposed to people after Minami Shunichi‘s unexpected actions. Minami Shunichi assures her that no one will notice in such a group photo—although it wouldn’t matter if anyone did noticed. Minami Shunichi tells her that if anyone does notice, he’d take responsibility for her and protect her. These words has Horikiri Chiyomi ask him to clarify, "What do you mean protect me?" Minami Shunichi answers it straight and simple. "What the word means." 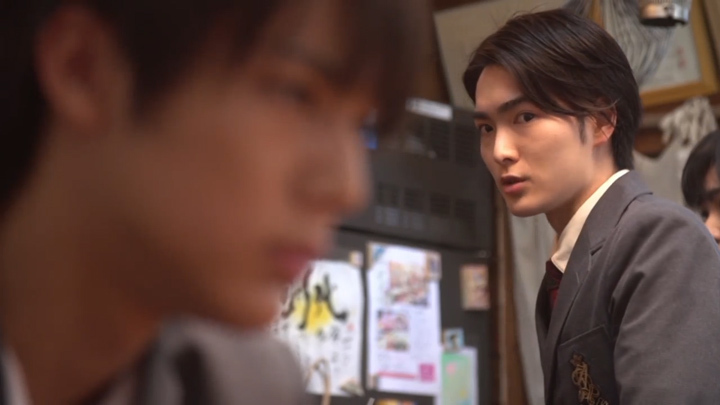 Horikiri Chiyomi leaves Minami Shunichi‘s desk and heads outside. She doesn’t want to misunderstand and tells herself it’s not how he meant it, but at the same time, she can’t help to getting excited about what she just heard. She starts to practice some her dance the balcony. As Horikiri Chiyomi practices, next door her sister visits Horikiri Chiyomi‘s room. She heads over to her desk and wonders aloud where she went. Horikiri Asuka notices the starry sky outside. She opens the window to gaze at the stars, smiling as she notes how pretty it is. 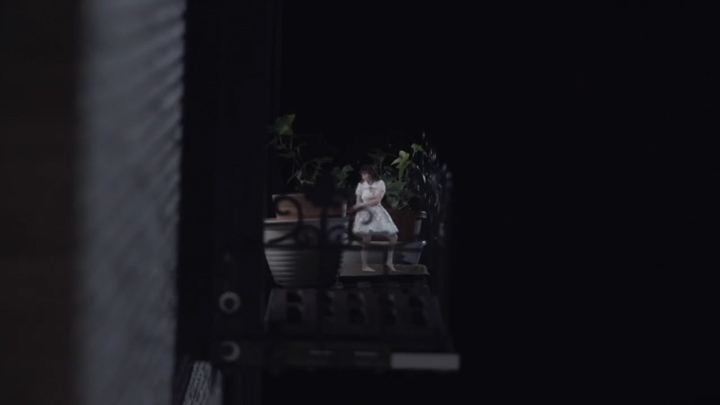 Her gaze lowers and catches onto the dancing figure on the balcony. Wide with shock, she stares. It’s Horikiri Chiyomi. Super awesome development between Minami Shunichi and Horikiri Chiyomi! With this week’s episode having Minami Shunichi not only bring Horikiri Chiyomi out of his pocket, but be fine that she’s captured in a photo for people to possibly notice, it doesn’t look like he thinks Horikiri Chiyomi is a burden to him at all! His promise to take responsibility for her and protect her sounded very genuine. Then to hear him confirm he meant what he meant after Horikiri Chiyomi asked him to clarify, it can’t possibly be a spur of the moment action. He must have thought it over. If not that, then he must be very sure despite it being a spur of the moment thing because he did not stutter one bit or try to take his words back. 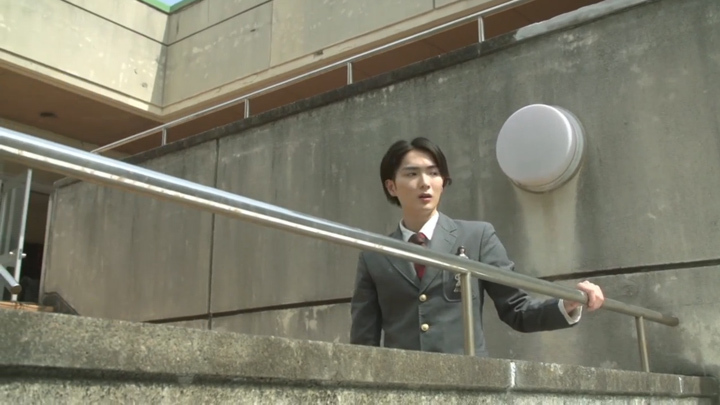 After Horikiri Chiyomi left his desk to go outside to dance, we did find the look on Minami Shunichi a bit curious, though. He had this slightly wide-eyed look on him. We can’t tell he’s worried he’s said too much and unexpectedly revealed his feelings or that he’s surprised by his own words and having said them out so easily. Maybe he himself didn’t even know he was so willing to take such responsibility. So, the episode ends with Horikiri Asuka discovering her sister. This time, she sees her in the flesh! We can only guess what will happen, but we won’t need to since a late follow of the drama means Episode 8 waiting for us. On to Episode 8 we go! :oD :oD.